The proportional pressure reducing valve PDMC05S30A-50 is a direct-acting spool type valve. When there is no energy, the spring pushes the control spool towards the solenoid system. There is flow through the valve from port 2 (consumer) to the tank port 1. When the inlet pressure fluctuates it provides an almost constant outlet pressure – depending on the energization of the coil. When the control current increases, the coil exerts a force on the control spool. It then connects port 2 (consumer) with pump port 3. This compresses the reset spring of the control spool. 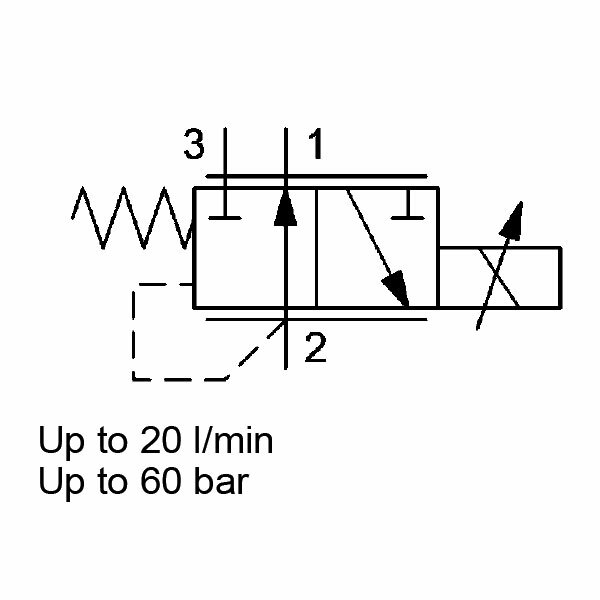 What’s more, the pressure at port 2 acts against the solenoid force over a circular ring area. So, when we reach the pre-set value, the pressure plus spring force and solenoid force are in balance. Therefore, there is a restriction on the connection between pump and consumer ports. Any pressure at tank port 1 is additive to the pre-set control pressure. The design of the valves specifically answers for high dynamic performance and low pressure drops.